Messner, Kate, The Seventh Wish. Charlie feels like she’s always coming in last. From her Mom’s new job to her sister’s life away at college, everything else seems more important than Charlie’s upcoming Irish dance competition, her science project, or how much she misses her sister. One day, while ice-fishing, Charlie catches a fish which offers to grant her a wish in exchange for its freedom. The most serious plot point involves the discovery of her older sister’s heroin addiction, and her subsequent treatment. I like the plot twist in this book when Abby is happy and health and then suddenly shes doing drugs. 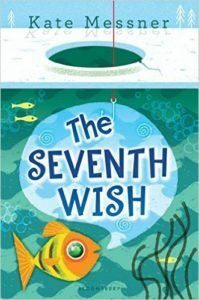 The Seventh Wish was a very good book. Charlie was never selfish when making wishes. I would definitely recommend this book. I like this book because I like how Charlie only wishes for the best things and shes not selfish about the wishes she could possibly wish for. Like she could wish for a whole bunch of things but she decides to wish for good things for other people like wishing Drew does good at basketball practice. I loved this book, the plot changes are great. I could not put this book down. I love how there are a lot of words. I am a very big reader. I would recommend this book. I love this book, the writer is very good.